Difference between revisions of "X3D version 4.0 Development"
Each of the following possibilities for X3D version 4 have been discussed by the various X3D working groups during meetings and on mailing lists. 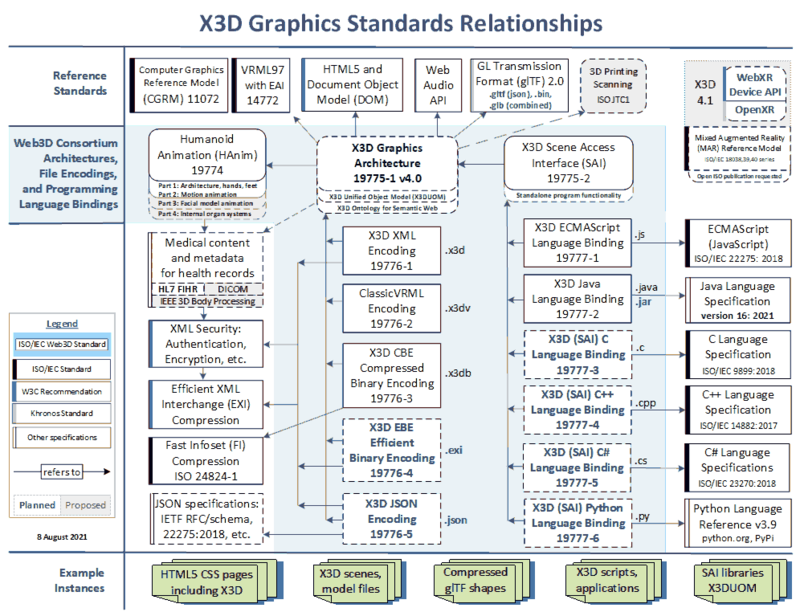 Each potential capability is considered to be a feasible (and in most cases, straightforward) addition to the existing X3D version 3.3 architecture. SVG: Possible use of SVG for image generation on the fly. Images could be static or dynamic. See W3C Graphics on the web. Audio and video: alignment with W3C Audio Working Group, especially for Web Audio API and Web Midi API. Adding royalty-free formats, streamability, disabling attenuation, 3D aural spatialization using reflection from simple geometry (such as RESOUND). All suggestions and recommendations are welcome. Component improvements and additions are approved by Web3D Consortium members. TODO: Which experimental nodes are ready? Candidates include Fraunhofer, X3DOM, Cobweb, other members and working groups? TODO: articulate Big Data and Cloud, server-side visualization, related issues. Please contact us if you think additional technologies need to be considered.